Jessica Reidy interviewed members of The Cambridge Writers’ Workshop about our Pre-Thanksgiving Yoga and Writing Cleanse. Check out the article on Quail Bell or below! Below is an interview I conducted with some of the CWW folks involved with the retreat, including our Yoga teacher Elissa Lewis, our Co-Directors Diana Norma Szkoloyai and Rita Banerjee, and our interns Megan Tilley and Alex Carrigan. They share their insight and perspective on the relationship between yoga, writing, self-care, retreats, and cultivating discipline and productivity. JR: How can Ayurveda help your creative practice and well-being? EL: Meaning “the science of long life” in Sanskrit, this practice improves well-being by making our energy become “sattvic” or “balanced.” Aryuveda aims to balance energy, promoting a creative flow, which is essential for the many writers who get stuck in their own heads. Our workshop takes the Ayurvedic approach to yoga by catering to the individual, helping you become aware of ways you tend to go out of balance and gain insight on how to bring yourself back into balance. In Ayurveda there are three types, or ‘Doshas’: Vata, Pitta and Kapha. Most writers are Vata, dominated by the elements of air and space. Autumn is “Vata -season” making Vata traits more extreme. All three types are prone to being overtaxed by frenetic, anxious energy in Autumn. Our workshop offers techniques you can use to modify your creative practice according to your personal needs. JR: What is the CWW’s model? And why a juice cleanse? DNS: The Cambridge Writers’ Workshop has a tradition of pairing intensive writing workshops and craft of writing seminars with experiences that promote health and well-being. We have offered organic gardening, juice-cleanses, energy work, and yoga on our past writing retreats in the U.S. and abroad. We feel that when writers’ minds and bodies are healthy and clear of negative energy, they can better focus on their creativity. We hire wonderful writing faculty to teach craft of writing seminars that are most often designed to be applicable to all genres of writing. Our yoga coordinator, Elissa Lewis, designs the yoga classes so that the meditations and mantras can be applied to generate inspiration and clarity of focus in our writing workshops that follow. During the writing workshops, we generate new material or share texts and receive feedback. During craft of writing seminars, we learn about and discuss various aspects of our writing lives, including writing strategies, navigating writing problems, and establishing a sound network to support one’s writing life. 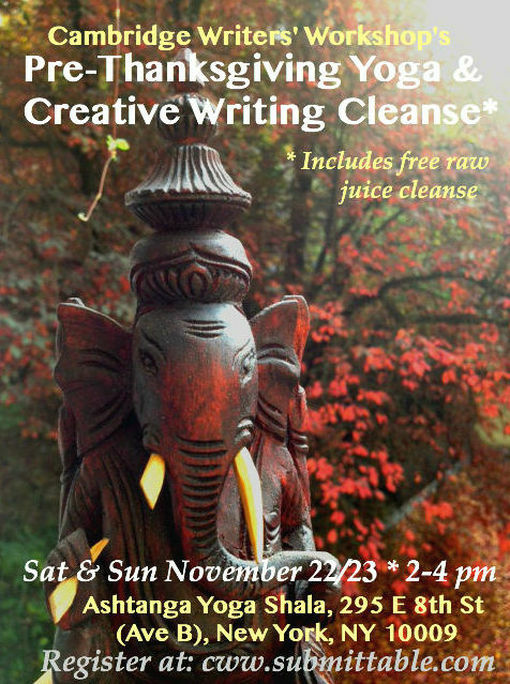 Below is the schedule for our Pre-Thanksgiving Yoga and Writing Cleanse in NYC coming up Nov. 22 & 23. Make sure to also check out our upcoming Writing & Yoga retreats in Newport, RI; Paris; and Granada this spring and summer! JR: How does the retreat community shape your work and practice? MT: One of the most wonderful parts about a retreat is the fact that you have other writers accessible, close to you, that you can turn to for workshopping and brain-storming at any time, outside of an academic setting. There’s no pressure for grades, or impending due dates, so the flow of conversation between you and other writers is a lot more relaxed. I tend to write more and a lot better when I have other people around me who continuously inspire me, and I stay more focused, and therefore get a lot more done (which is always a good thing). JR: How do retreats help sustain self-care and artistic discipline at home? AC: I think the retreat will teach us how self-care can influence artistic discipline and vice versa. Because of the retreat structure, the participants will be able to see how doing forty minutes of yoga can influence what they write in one of the workshops. I’ve started taking weekly yoga classes but still need to try doing yoga at home more. Perhaps by participating in this retreat, I’ll see how doing yoga before writing can spur my creativity. JR: How do you keep a regular creative work routine through the holiday stress? RB: When work and the holiday season are in full swing, things can get a little hectic. As a creative writer who works at a university, I’m often balancing project deadlines, multiple articles to write and revise, grading student exams and papers, advising thesis projects, getting back to editors, and preparing book manuscripts all while directing the Cambridge Writers’ Workshop with Diana Norma Szokolyai and working on my own creative writing. Having a strong and supportive group of writers and artists with whom I can commune has been essential to keeping me on task in terms of my creative projects. At the Cambridge Writers’ Workshop (CWW), for example, many of the executive board members, interns, and affiliates, have pledged to do a NaNoWriMo (National Novel Writing Month) Challenge for the month of November. We’re egging each other on to finish a book manuscript or write at least 50,000 words on our book projects by the end of November. While many of us are working on novels proper, several members of the CWW are also completing or revising poetry manuscripts, screenplays, story collections, and longer nonfiction narratives. And nearly each week during a CWW board meeting or through email, writers who have taken the NaNoWriMo pledge check in with one another to see how each other’s writing projects are going. So while November signifies the beginning of the holiday season and one of the busiest times of the year, it’s incredible to reimagine November as a month dedicated to the craft of writing and harnessing one’s creativity within a supportive group of comrade writers. As a writer, I also try to maintain a practice of daily creativity. I try to work on one creative project each day. For my novel project for NaNoWriMo, I often draft scenes, dialogues, and character sketches or location and background information by hand. It’s liberating to jot down a note to yourself about a future creative writing project, chapter, or idea for a poem, even when you’re on the go. A group of writers are gathered in a room (with pens, papers, and their digital or analog notebooks ready). In order to play a game of “Mis/Translations,” each writer has brought with him/her a poem or text to read in a “foreign” language. The poem can be originally transcribed in a “foreign” language such as Hungarian, Romani, Medieval French, Bengali, Tagalog, Swahili, Hebrew, or Mandarin, for example, or can be part of an “invented” language such as Pig Latin, Esperanto, Sound-Painting, or gibberish. Once the “foreign” language texts have been chosen, each reader shares his/her piece with the group of writers. Each writer, then, is responsible to hear and “translate” what is being said into a lyrical or narrative text. Writers are welcomed to create poems, songs, flash fiction pieces, personal essays, etc. about what they are hearing. Based on the emotive quality of each text being recited, its musicality and structural repetitions, or the play of sense and nonsense which occurs when interpreting the sounds and rhythms of a “foreign” language, each writer has to interpret and transcribe what is being conveyed and said within a given piece. Each written piece, is thus, an act of translation and purposeful mistranslation, and can function as a fun, provocative, or eye-opening creative piece on its own. This “Mis/Translation” exercise can also be done visually with written texts in foreign languages as Robert Lowell had previously demonstrated with his series of “Imitations.” And as an exercise, it’s a wonderful way to kick-start the imagination and get out of that dreaded valley called writer’s rut. I made this juice to fuel me for the CWW NaNoWriMo Challenge. Rita Banerjee is a writer, and received her PhD in Comparative Literature from Harvard University. She holds an MFA in Poetry and her writing has been published in Poets for Living Waters, The New Renaissance, The Fiction Project, Jaggery, The Crab Creek Review, The Dudley Review, Objet d’Art, Vox Populi, Dr. Hurley’s Snake-Oil Cure, and Chrysanthemum among other journals. Her first collection of poems,Cracklers at Night, was published by Finishing Line Press in 2010 and received First Honorable Mention for Best Poetry Book at the 2011-2012 Los Angeles Book Festival. Her novella, A Night with Kali, was digitized by the Brooklyn Art-house Co-op in 2011. She is a co-director of the Cambridge Writers’ Workshop, and her writing has been recently featured on HER KIND by VIDA: Women in Literary Artsand on KBOO Radio’s APA Compass in Portland, Oregon. Elissa will be leading our yoga workshops at this event. Jessica Reidy Jessica Reidy is a mixed-Romani (Gypsy) heritage writer from New Hampshire. She earned her MFA in Fiction at Florida State University and a B.A. from Hollins University. Her work has been nominated for a Pushcart, and has appeared in Narrative Magazine as Short Story of the Week, The Los Angeles Review, Arsenic Lobster, and other journals. She’s a staff-writer and Outreach Editor for Quail Bell Magazine, Managing Editor for VIDA: Women in the Literary Arts, Visiting Professor for the Cambridge Writer’s Workshop retreats, and Art Editor for The Southeast Review. She also teaches yoga and occasionally still works her family trades, fortune telling and dance. Jessica is currently working on her first novel set in post-WWII Paris about Coco Charbonneau, a half-Romani burlesque dancer and fortune teller of Zenith Circus, who becomes a Nazi hunter.